Raise one wheel, put it in 5th gear and see if you can turn the motor over by turning the raised wheel. This will tell if it died due to being locked up. The oil light will come on as a result of the engine stopping due to no oil pressure. Unless you are saying the oil light came on and then after a few moments it died. Mine turned out to be old gas trash in the lines. were the valves adjusted correctly before driving? You said it sounded like crap which leads me to believe the valves or timing wasn't set correctly to begin with. no adjustments sounded to me like the timing was off - i though it was due to old gas that had not octane left in it. I've had the alternator belt fly off, which makes a nice noise, and it then knocked off the wires to the coil causing the engine to stop. Maybe post a picture of the engine bay and people can see if anything looks weird? OP - can you pull valve covers and make sure everything looks OK there (or post pics)? Also - can you slowly rotate the engine by hand (pull the plugs first) and see if there is any binding? If you pass both of those tests then likely in the clear. P.S. - I just moved (with my 75) to the Westwood area. Would love to meet up sometime and see if I can offer any help. I'm out of town for the next week and a half but would otherwise happily offer to come take a look. Jacking it up in 5th and turning one wheel will let you know if it’s internal. Pulling all the spark plugs and using the starter to turn it over will be second. you rock (IMG:style_emoticons/default/aktion035.gif) - let me know your schedule and maybe your can stop by and we can suss out how bad the damage is. PM me and we can make an arrangement from there - and lunch is on me. ok I will take some pics this weekend and see i that reveals anything, ill do the valve covers as well - i guess those are accessible from underneath correct??? Dang it, sorry this happened. Trailer or tow it to the El Segundo event Sunday, there will be some pretty smart 914 people there. But sounds like you should have know better then starting it up in the 1st place . Hey John Pierre - I closed up my shop a few years ago, but I'm still in So Cal part-time. I'm gonna try to make it up to the Automotive Museum event in El Segundo on Sunday morning ... maybe a few guys can shoot up to your place to take a look at the issue you're facing? The 'tin can' sound could have been pinging. If the fuel lines are kinked or clogged they would reduce fuel flow, making the mixture lean. That could ping and then die. Was it the green or red light that came on? Green = alternator. Probably the belt broke. Red = oil pressure. Something more serious but can't tell from just the sound description. regardless of what i did or if i can get some help - i still need to get a good trustworthy mechanic or shop. 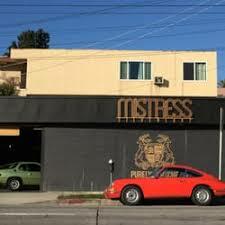 has any that lives here in LA heard of a place called Mistress in Silverlake? I do some work around the sunset/hyperion area and this shop always has some amazing looking porsches in it - i even think i saw a singer like 911 in it. I stopped by and got a good vibe from the guys the were there.